Following his public criticism of David Cameron the BBC are reporting that the Party has suspended Ali Miraj from the candidates list. Cardiff North has a slender Labour majority of just over 1000. Former Brecon & Radnor MP and former leader of the Conservative MEPs, Jonathan Evans MEP, will face Herefordshire Councillor Kay Swinburne at an open primary on September 6th. Therese Coffey and Hillingdon Council Deputy Leader David Simmonds were also on the shortlist. If you are local and want to attend, the constituency office's details are here. Labour has a projected majority in the seat of 1,664. There will be an open primary selection on July 26th, between James Atkins, Suhail Rahuja and Mark Versallion. The seat is held by Labour's Beverley Hughes by over 8000 votes. Click continue to read candidate statements. Are selections being delayed because of the quest for more women candidates? A couple of weeks ago ConservativeHome learnt that four parliamentary selections in the West Midlands had been postponed; Walsall North, Walsall South, Wolverhampton SE and Wolverhampton NE. We were informed that the principal reason for the postponement was an inadequate number of female applicants. A CCHQ source didn't exactly deny this when we questioned them earlier this week although we were told that the number of applications had been disappointingly low overall - from both men and women. The Burrowes/ Shapps analysis - which argues for early selection of people with local understanding - should be trumping the desire of CCHQ to increase the number of women candidates - particularly given the increasing likelihood of an autumn election. A North West Leicestershire District Councillor, Rowena Holland was selected yesterday evening to fight Nottingham South after an open primary. The seat has a projected Labour majority of 7,234. Blogger Glyn Davies has been selected as the Tory candidate for Montgomeryshire. He has the task of unseating Lembit Opik and overturning a projected LibDem majority of 7,020. Mr Davies lost his position as Assembly Member for Mid and West Wales in May's elections. "I am very pleased but do not under-estimate the challenge which lies ahead to win this seat. Welsh Conservatives showed at the recent Assembly elections that we can challenge the LibDems in what is perceived to be their territory and win more votes than them. I hope to continue that trend at the General Election. Since I lost my Assembly seat I've been anxious to get back into frontline politics and serve the people of Montgomeryshire. Tonight's result allows me to do just that. This is the start of a new and exciting period for the Welsh Conservative Party and for me personally. I very much hope that we are both successful." Local councillor Matthew Riddle was selected ahead of Eleanor Jupp last night. LibDem MP Steve Webb has over an 11000 majority in the new seat. Graham Robb has issued the following video ad as he reaches the final stage of his effort to be Sedgefield's next MP. Click here to help Graham or for more information on his campaign. James Gray has been partially cleared of alleged abuse of his parliamentary expenses by Parliamentary Standards Commissioner Sir Philip Mawer. Download Mawer's letter here. "I am happy that Sir Philip has dismissed any suggestion of deliberate dishonesty on my part and has found that there was no case to answer on the three main allegations against me. I fully accept his conclusion that there was some accidental and partial overpayment at the end of Sarah’s employment, which he accepts was not deliberate. I have apologised for that oversight, and have arranged to repay the relatively small amount of money involved to the Parliamentary authorities." At the end of January this year Gray won a ballot of local members to remain the MP for Wiltshire North, after having lost the confidence of the Association exec following his high profile extra-marital affair. Click here to watch a video of our Sedgefield candidate Graham Robb debate with his principal opponents. Click here to offer help to Graham in these last few days of the campaign. "For years we've turned the other cheek as the LibDems have wilfully broken copyright in order to gain political advantage by misrepresenting our material. Now the time has come to say enough is enough." The Conservatives got their solicitors to work yesterday in what should be an open and shut case. The LibDems will almost certainly have to pay approximately £10,000 in costs as well as the yet-to-be assessed damages. Expect more fun and games this week. More details on the selection here. The BBC is reporting that a fresh ballot of the executive of Sir Patrick Cormack's South Staffordshire Conservative Association has resulted in a tie. The fresh ballot was held after discrepancies were alleged in the first ballot. 82 MPs wrote in support of Sir Patrick but were insufficient to win over the executive. Sir Patrick's future will now be decided by all 500 or so members of the Association in a secret ballot. Sir Patrick is expected to win that ballot. An analysis by ConservativeHome of those adopted as Tory candidates for the next General Election says that there would likely be fifty to sixty women Tory MPs if the Conservative Party formed a majority after the next General Election. There are currently just 17 Conservative female MPs. Although the Tory leadership has failed to deliver their ideal aim of half of Tory candidates being women there has been significant progress with women doing relatively better in the most winnable seats. Although, for example, only 31% of all adopted candidates are women, 46% of the candidates (11) adopted for the 24 seats with notional Tory majorities are women. The ratio deteriorates thereafter. 35% of candidates selected for the top twenty target seats are women but just 28% for the top 75 target seats. Women most likely to be Tory MPs after the next General Election include Karen Bradley (Staffordshire Moorlands), Harriett Baldwin (West Worcestershire), Andrea Leadsom (South Northamptonshire) and Penny Mordaunt (Portsmouth North). On current selections, half a dozen candidates from ethnic minorities are likely to enter Parliament as Tories - joining Adam Afriyie and Shailesh Vara. Priti Patel (Witham) and Rehman Chishti (Gillingham and Rainham) are the two "BME" candidates in the group of notionally Conservative seats. Three BMEs have so far been selected for the top 75 seats: Wilfred Emmanuel-Jones (Chippenham), Zahid Iqbal (Bradford West) and Paul Uppal (Wolverhampton SW). Six BMEs so far selected for top 150 seats: including Alok Sharma (Reading West), Mark Clarke (Tooting) and Shaun Bailey (Hammersmith). The party also has hopes that Tony Lit may join the green benches as the unlikely new Tory MP for Ealing Southall after next Thursday. ConservativeHome Comment: "Although David Cameron's A-list alienated many Conservative activists it has undoubtedly contributed to a significant increase in the number of women who would sit as MPs on the benches of a Tory government. Many come from conventional Conservative backgrounds, however. Most of the women selected appear to come from the law or the City. Few have public or voluntary sector backgrounds. The party has also yet to address the issues of financial exclusion. The £41,000 average cost of becoming a Tory MP at the last General Election may deter excellent candidates with modest backgrounds from becoming an MP." Cllr Matthew Offord was adopted as the Conservative candidate for the very winnable seat of Hendon at last night's open primary. Sian Flynn was adopted last night as the Conservative candidate for North Cornwall during an open primary meeting. She will have to overturn a projected LibDem majority of 5,477. "My family has had roots in North Cornwall for many years, and I’ve been a regular visitor throughout my life. I am honoured to stand as your Conservative candidate. We are in the process of moving our home here, and, until then, I have a permanent base with family in Wadebridge. I’ve served as a Borough Councillor in Surrey, have extensive experience in the NHS, and the criminal justice system, as well as a background in fundraising. I will bring this depth of experience to North Cornwall, to use for the benefit of all residents, to make sure our voice is heard at Westminster. I will work with all the Cornish MPs to keep our needs high on the agenda. 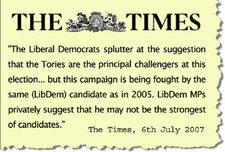 "Jack Straw called the LibDems the vultures of politics and that is the first time I have ever agreed with Jack Straw. I am looking forward to the fight. If David Cameron is to reach No.10 we needs to win seats like Yeovil, I am very excited by the prospect of helping him on that journey." Peter Aldous - who fought the seat last time - was readopted tonight. Our congratulations to him. Macclesfield Councillor Graham Evans was selected for Weaver Vale on Saturday, Graeme Brown was the runner-up. He has a notional Labour majority of 4750 to overcome. Jackie Doyle-Price, Kay Mason, former candidate Peter Aldous, and young barrister James Tumbridge have gone through to tonight's open primary. Waveney has a notional Labour majority of just under 6000. Either Sian Flynn, Sam Manning-Smith or Alastair Watson will be selected by open primary tonight. Biographies are on the South West Conservatives' website. The seat is held by LibDem Daniel Rogerson with a notional majority of more than 5000 votes due to boundary changes. The projected Labour majority is 6,918. Click here to visit Graham Robb's official campaign site. 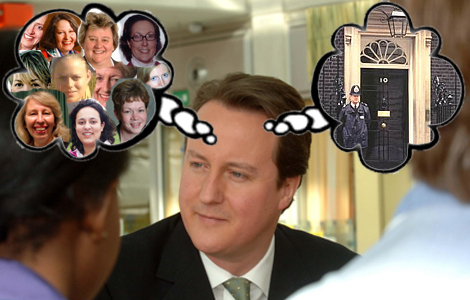 There's a video of David Cameron's visit to Tony Blair's vacated seat on this page. Kevin Hollinrake was selected at last night's Dewsbury open primary - beating Karen Woods for the opportunity to overturn Shahid Malik's projected Labour majority of 4,924. Local councillor and business consultant Adrian Owens won the open primary last night. The seat has a 6000 Labour majority. "With an acumen not usually associated with the Conservative Party, the Tories have moved to capitalise on their success, choosing as their candidate one of Britain's most successful Asian businessmen - whose business happens to be based in Southall." "As Mr Lit walked down the road, people rushed out to meet him and gave him the thumbs up through shop windows. He has charisma, is well groomed and appears to be expensively tailored. He easily eclipsed Ken Clarke, the Tory grandee who had turned up to lend his support, suggesting that the Tory leader’s big tent approach to candidate selection – particularly in a constituency where 62 per cent of voters are from ethnic minorities – may pay dividends." "The Liberal Democrats splutter at the suggestion that the Tories are the principal challengers at this election, after they came second in the 2005 general election. The party’s talented election supremo, Chris Rennard, has taken charge." "To anyone outside the more ideological ranks of the Tory membership, Mr Lit looks the kind of person all the parties are desperate to attract, a rather impressive and personable candidate whse main risk is that he might actually win the Tories some votes." "Lit was also an official ambassador for London's Olympic bid and has advised Buckingham Palace on community cohesion. he has also been a fashion model, which seems to be helping with the younger, female voters." "The sight of all those Tory posters in the windows of Southall's sari shops, grocers and restaurants is testimony to the Lit family's links with the area. As always, with prominent local businessmen, the lits have admirers and detractors in the community." Mark Brooks, Jackie Doyle-Price, Eleanor Jupp and Alberto Costa are finalists for Thurrock, a seat with a 5501 Labour majority. Councillor Ron Bell was selected by open primary in a "big event" over the weekend. The seat has a notional Labour majority of under 6000.